All in one for marketing oriented packages: BG PACK designs the 90° revolving sealing carriage and a series of technical parts supplied with the machines that allow VETTA to produce a large range of various and innovative packages and with rapid format changes. Suitable for wrapping granular products (chips/crisps, candies and many others) and all types of food products that would normally be consumed in more than one stage. Vetta Zip Pack: it applies the zip on standard 3-seal packs, or on oval bottom packs, square bottom and 4-seal square bottom packs (Steelo Pack). 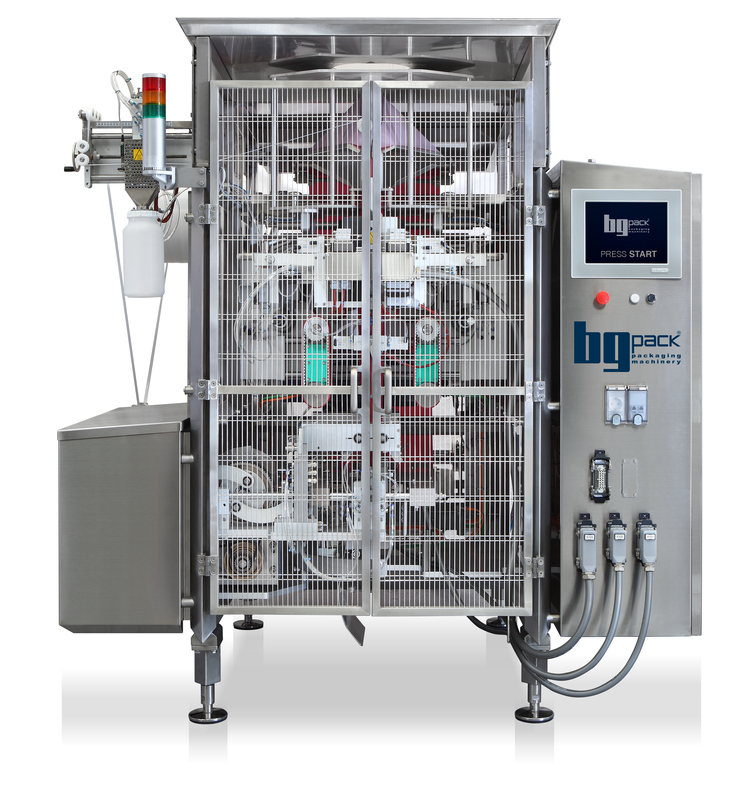 All on one: the Vetta is a Form Fill Seal machine that separates itself from the rest of the pack by offering “multiple bag style” varieties and the versatility of many machines in one system. Vetta can offer up to 30 different bag styles, from standard vertical form fill and seal using clear or printed film, to stand-up oval bottom bags with sombrero hole punch. reach, easily accessible and extractable. Revolving sealing carriage system: the change of format is possible in few minutes. The revolving sealing carriage allows an extremely operative easiness and makes it possible to realize up to 28 variables of possible packs. Electronics: the machine working depends on independent motors controlled by PLC or industrial PC interfaced by colour touch screen with possibility of connection via modem for on-line Teleservice. Complete and integrated line: Vetta can be combined with the range of MBP multihead weighers (PFM group) in which any aspect of communication and system integration is brilliantly solved. In this way elevated standard of reliability, precision and elevated average productivity are assured. Packaging line composed of a MBP 14C2 multihead weigher and a BG Pack Vetta for shredded cheese packaging.